Before Workouts: Platinum Hydrowhey® mixed with skim milk + Micronized Creatine powder. Why? Hundreds of clinical studies support creatine monohydrate's ability to boost strength, size, and power. Combining creatine with protein and carbohydrate increases muscle uptake. 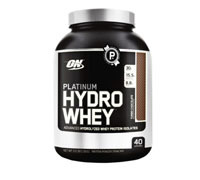 Directions: Platinum Hydrowhey® is INSTANTIZED, so it always mixes up easily and completely. Simply add 1 scoop of Platinum Hydrowhey® to a blender, shaker cup, or glass filled with 12 ounces of cold water, milk, or juice and blend, shake, or stir for 20-30 seconds or until powder is dissolved. TIP: Adjust the intensity of your Platinum Hydrowhey® shake by varying the amount of liquid you use to prepare it. For a slightly thicker consistency with a bolder flavor, mix each scoop with 10 ounces of water. For a milder tasting less sweet shake, use 14-16 ounces of liquid per scoop.